The offered data set comprises the database of the 26,000 official facilities of Catalonia, the 1,400 procedures handled in the Government’s offices and some of its multimedia archives. Also delivers the data in different types of formats (doc, xls, shp, pdf, odf, csv, xml, tmx, json, rdf-xml, etc…). The data is available under 4 possible licences, among which two creative commons licences. So, what can we do with this data? you can plug it to Impure! Impure has been created by Bestiario, a Barcelona Spain based start-up, has been exploring and inventing new interactive visualization paradigms over the past 5 years. 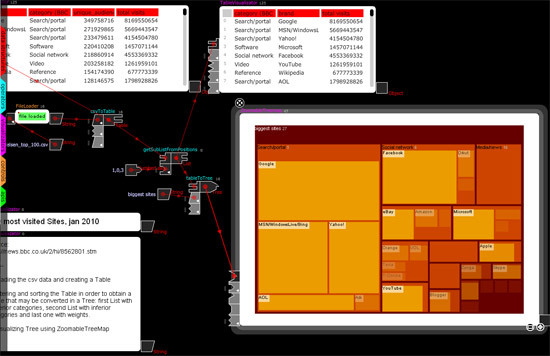 Impure is a visual programming language aimed to gather, process and visualize information. With impure it is possible to obtain information from many different sources; from user owned data to diverse feeds in Internet, including social media data, real time or historical financial information, images, news, search queries and many more. It is a tool to be in touch with data around the Internet, to deeply understand it. Within a modular logic interface you can quickly link information to operators, controls and visualization methods, bringing all the power of the comprehension of information and knowledge to the non programmers that want to work with information in a professional way. The application provides a set of examples to getting started, as well as good documentation and a wiki. Don’t forget to visit also its impure gallery’s photostream on flickr.